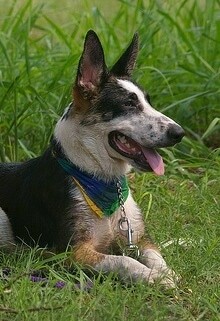 The Panda Shepherd is a piebald colored German Shepherd. It is well proportioned and very strong. The piebald coloring has occurred in a single GSD bloodline. It is 35% white, the remainder of coloring is black and tan, and it has no white German Shepherds in its ancestry. The Panda Shepherd has a sturdy, muscular, slightly elongated body with a light, solid bone structure. The head should be in proportion to its body, and the forehead a little rounded. The nose is most often black, however blue or liver still do sometimes occur, but are considered a fault and cannot be shown. The teeth meet in a strong scissors bite. The dark eyes are almond shaped and never protruding. 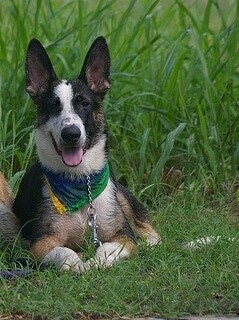 The ears are wide at the base, pointed, upright and turned forward. The ears of puppies under six months may drop slightly. The bushy tail reaches almost to its hocks and hangs down when the dog is at rest. The front legs and shoulders are muscular and the thighs are thick and sturdy. The round feet have very hard soles. Often used as working dogs, Panda Shepherds are courageous, keen, alert and fearless. Cheerful, obedient eager to learn, tranquil, confident, serious and clever, Panda Shepherds are extremely faithful and brave. They will not think twice about giving their lives for their human pack. They have a high learning ability. Panda Shepherds love to be close to their families, but can be wary of strangers. This breed needs his people and should not be left isolated for long periods of time. They only bark when they feel it is necessary. Often used as police dogs, the Panda Shepherd has a very strong protective instinct, and is extremely loyal to its handler. Socialize this breed well starting at puppyhood. Aggression and attacks on people are due to poor handling and training. 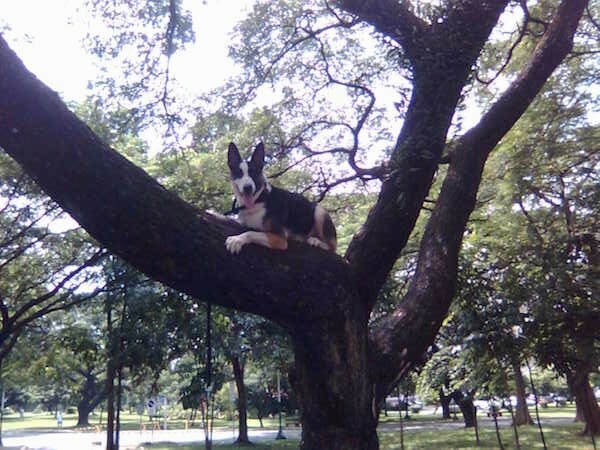 Problems arise when an owner allows the dog to believe he is pack leader over humans and/or does not give the dog the mental and physical daily exercise it needs to be stable. This breed needs owners who are naturally authoritative over the dog in a calm, but firm, confident and consistent way. A stable, well-adjusted and trained dog is, for the most part, generally good with other pets and excellent with children in the family. They must be firmly trained in obedience from an early age. Panda Shepherds who have passive owners and or whose instincts are not being met can become timid, skittish, may be prone to fear biting and develop a guarding issue. They should be trained and socialized from an early age. Panda Shepherds will not listen if they sense that they are stronger minded than their owner, however they will also not respond well to harsh discipline. Owners need to have an air of natural authority to their demeanor. 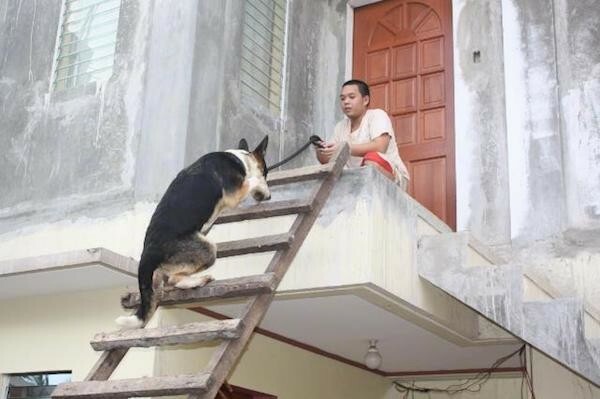 Do not treat this dog as if he were human. Learn canine instincts and treat the dog accordingly. Panda Shepherds are one of the smartest and most trainable breeds. With this highly skilled working dog comes a drive to have a job and a task in life and a consistent pack leaderto show them guidance. They need somewhere to channel their mental and physical energy. This is not a breed that will be happy simply lying around your living room or locked out in the backyard. 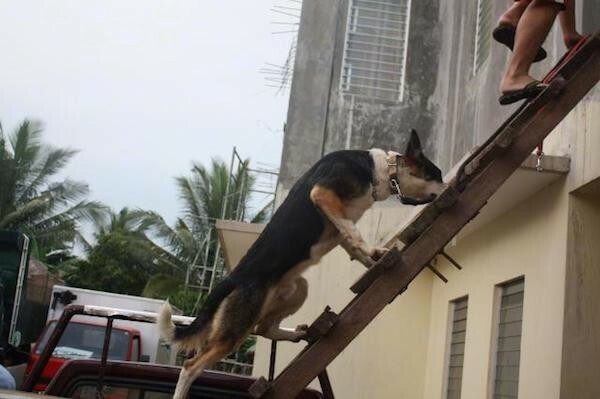 The breed is so intelligent and learns so readily that it has been used as a sheepdog, guard dog, in police work, as a guide for the blind, in search and rescue service and in the military. The Panda Shepherd also excels in many other dog activities including Schutzhund, tracking, obedience, agility, Flyball and ring sport. 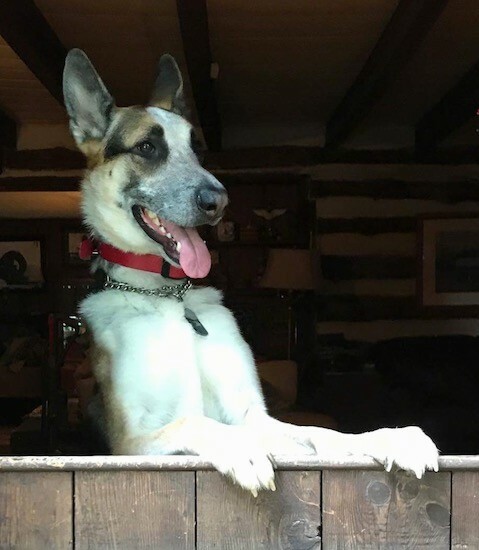 His fine nose can sniff out drugs and intruders, and can alert handlers to the presence of underground mines in time to avoid detonation, or gas leaks in a pipes buried 15 feet underground. The Panda Shepherd is also a popular show and family companion. Indiscriminate breeding has led to hereditary diseases such as hip and elbow dysplasia (be sure both parents have had their hips certified at least OFA good), blood disorders, digestive problems (probably due to nerves), epilepsy, chronic eczema, keratitis (inflammation of the cornea), dwarfism and flea allergies. 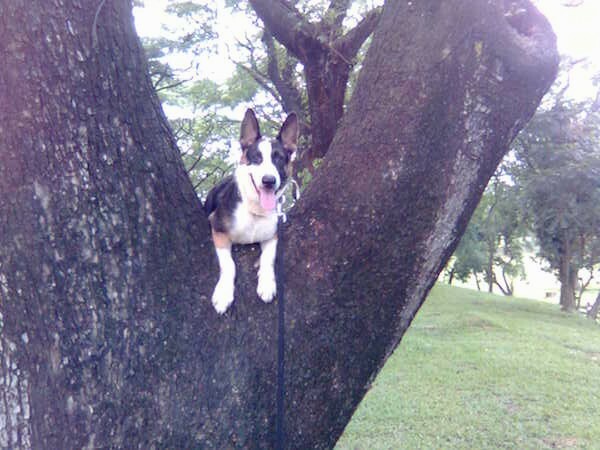 The Panda Shepherd will do okay in an apartment if sufficiently exercised. These dogs are relatively inactive indoors and do best with at least a large yard. 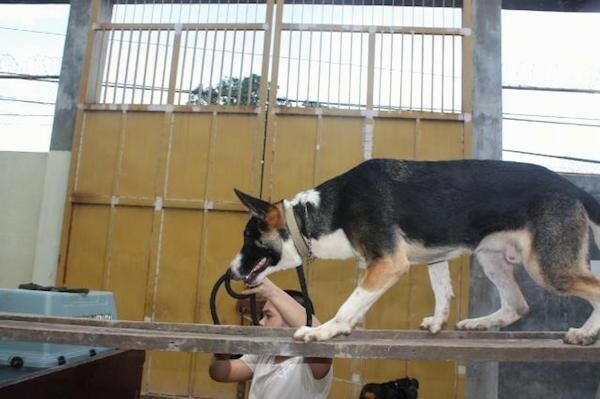 Panda Shepherd Dogs love strenuous activity, preferably combined with training of some kind, for these dogs are very intelligent and crave a good challenge. They need to be taken on a daily, brisk, long walk, jog or run alongside you when you bicycle. While out on the walk the dog must be made to heel beside or behind the person holding the lead, as in a dog's mind the leader leads the way, and that leader needs to be the human. Most shepherds love to play ball or Frisbee. Ten to fifteen minutes of fetching along with daily pack walks will tire your dog out quite nicely as well as give him a sense of purpose. Whether it is ball chasing, Frisbee catching, obedience training, participation in a canine playgroup or just taking long walks/jogs, you must be willing to provide some form of daily, constructive exercise. The daily exercise must always include daily walks/jogs to satisfy the dog’s migration instinct. If under-exercised and/or not mentally challenged, this breed can become restless and destructive. Does best with a job to do. The Panda Shepherd Dog is a piebald German Shepherd that has occurred in a single GSD bloodline. It is 35% white, while the remainder of coloring is black and tan. It is a spontaneous mutation and has no White German Shepherds in its ancestry. 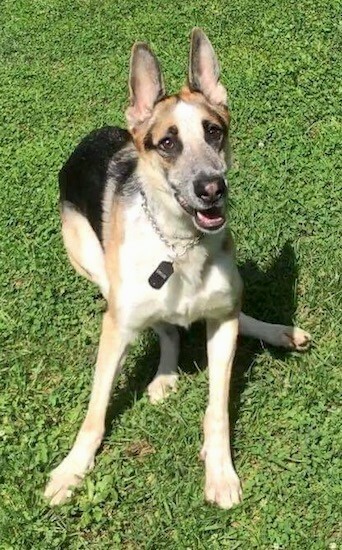 The parents that produced the black/tan/white female puppy were a purebred black German Shepherd dam and a purebred black and tan German Shepherd sire. The rest of the puppies in the litter were standard looking black and tan German Shepherd pups. The sole black/tan/white puppy also had two blue eyes. In order to protect the image of her breeding program, the founding breeder Ms. Cindy took the piebald puppy to Ohio State University Veterinary Hospital for genetic DNA testing to find out the exact cause of the anomaly. The parents of the pups were confirmed as purebred GSDs with no White GSD or other breeds in their lines. This was a purebred GSD that was born with piebald coloring. The same sire and dam that produced the piebald puppy were bred three more times and all the pups were born with the traditional black and tan coloring. 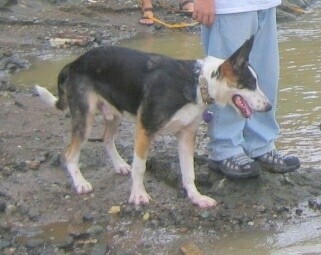 A lot of canine genetic coat color testing was done on the piebald puppy who was named Frankie. 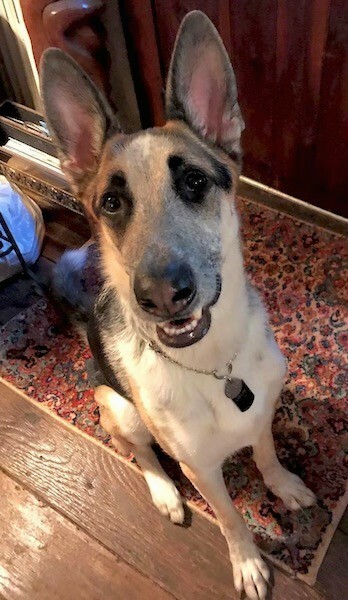 When Frankie matured she was bred to a traditional colored black and tan GSD. Out of the four puppies born, three turned out to have black/tan/white coats but lacked the blue eyes, while the fourth puppy was the traditional black and tan coloring. The black/tan/white German Shepherd Dogs were given the name Panda Shepherds. 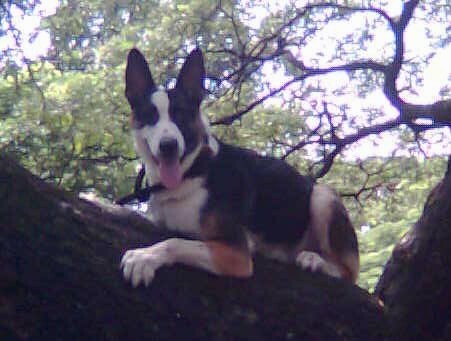 Hitman the Panda Shepherd at 6 months old—bred by Emmanuel Lintag, whose dam and sire of Hitman were both black and tan. Hitman was the only Panda in the litter. Hitman the Panda Shepherd at 7 months old with his owner, bred by Emmanuel Lintag— "Hitman and I hike in the mountains and do some river crossing." 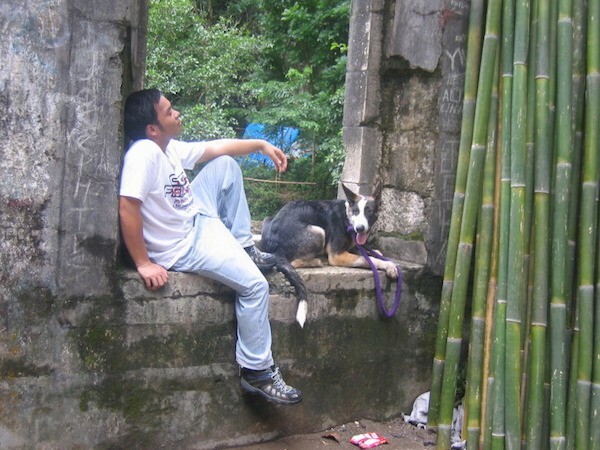 "Hitman the Panda Shepherd at 9 months old during our adventure in the field of University of the Philippines."